My smart idea of writing copy for a few posts while on the plane backfired on me, it seems, as the laptop I used is now currently in the hands of our father. Hence, my text is inaccessible at this time. 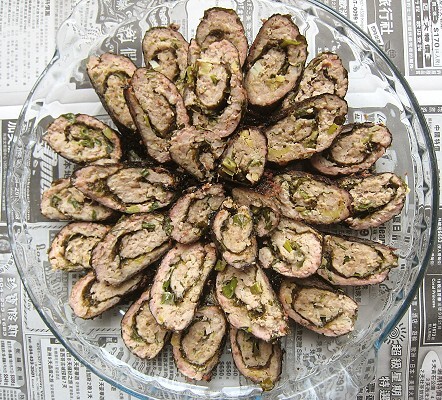 So, I had to fast-track these nori-wrapped pork rolls so that we'd have something to post! This is a Chinese dish that we could've submitted to Regional Recipes if this post wasn't so late. This was one of the recipes that have gotten away. 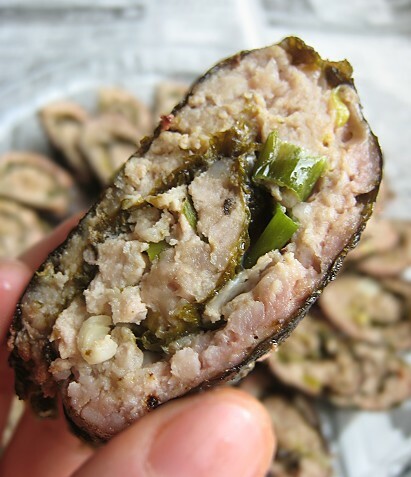 I remember Yaya used to make some sort of nori-wrapped pork, but she didn't make it that often. She must have only started making it later in her career and we didn't stay to enjoy the dish. 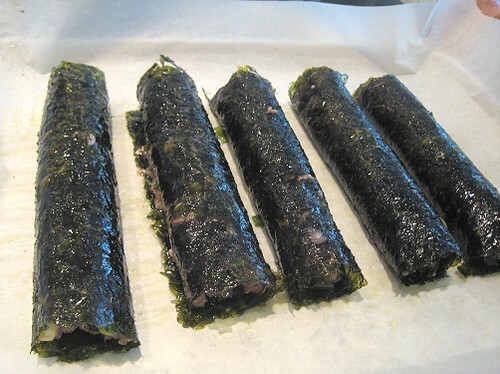 Yaya did include a recipe for nori-wrapped pork in the little green duo-tang she gave TS when we asked for her recipes. 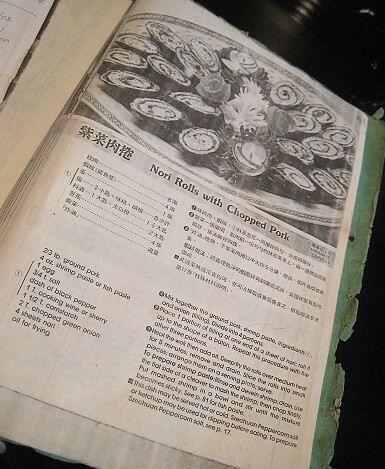 I believe it was a photocopy from a Pei Mei cookbook my mother had for the longest time. This is the same duo-tang housing her greatest hits: Golden Egg Torta, Philippine Hamburger, Philippine Pork "BBQ" and Chicken "BBQ". Given I was in a time crunch (again! ), I must have read the recipe and decided to just wing it with the pork filling this time around. I started with approximately a pound of ground pork, added in some chopped green onions, and some roasted and ground Sichuan peppercorns. A teaspoon of minced ginger and a couple of minced garlic, some soy sauce, a dash of sesame oil, a pinch of sugar, and the mixture was ready to roll. We had some seasoned seaweed (grilled laver with grapeseed oil, it said on the package) and I started trying to spread the mixture over each piece. Instead of pan-frying, I put them rolled pieces in a baking pan that has been greased with some canola oil and baked them for approximately 25 minutes. They did cook quite quick. The baking method was definitely easier, but if you prefer a crispier nori shell, then pan-frying would be the way to go. Here is a slice close-up. No, it's not still raw. When not browned, ground pork tends to have a pinkish hue. 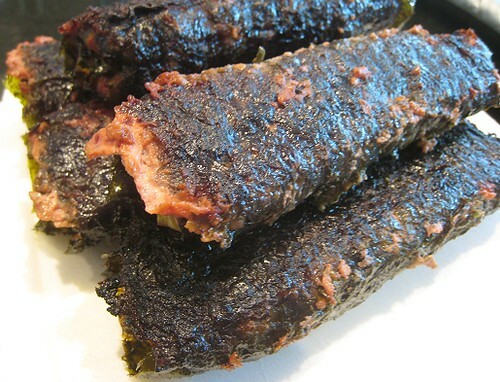 I love nori, so I was all over this. In fact, I believe I have made this dish once before, when I was oh-so-young and not very experienced in the kitchen at all. I recall mine needed a bit more seasoning, but it was all good as this dish actually takes ketchup as a condiment! You can eat it with or without; it's delicious either way. 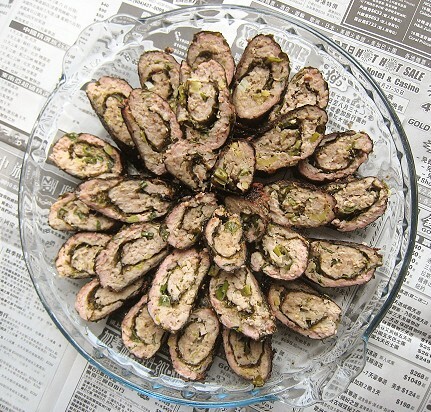 Of course, we ate it with rice, but I imagine that one could serve these as hors d'oeuvres. Mix all ingredients together until it comes to a smooth paste-like consistency. 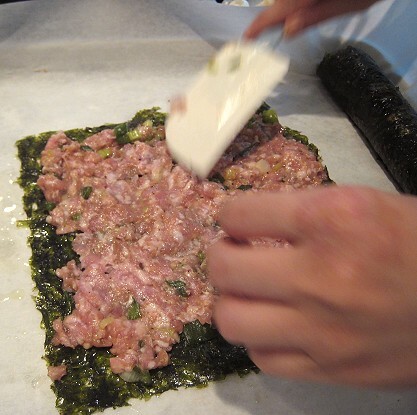 Spread over nori sheet thinly, as evenly as you can. Roll and seal the ends. Bake on a greased pan, in a 350 degree oven, for 25 to 30 minutes or until done. Slice into pieces. The rolls can be served with ketchup, or similar condiment.